Could the vitality of embodied experience create a foundation for a new form of revolutionary authority? The Life of the City is a bold and innovative reassessment of the early urban avant-garde movements that sought to re-imagine and reinvent the experiential life of the city. Constructing a ground-breaking theoretical analysis of the relationships between biological life, urban culture, and modern forms of biopolitical ’experiential authority’, Julian Brigstocke traces the failed attempts of Parisian radicals to turn the ’crisis of authority’ in late nineteenth-century Paris into an opportunity to invent new forms of urban commons. 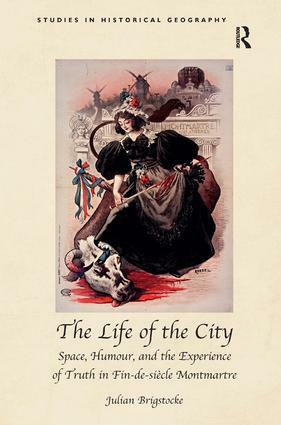 The most comprehensive account to date of the spatial politics of the literary, artistic and anarchist groups that settled in the Montmartre area of Paris after the suppression of the 1871 Paris Commune, The Life of the City analyses the reasons why laughter emerged as the unlikely tool through which Parisian bohemians attempted to forge a new, non-representational biopolitics of sensation. Ranging from the carnivalesque performances of artistic cabarets such as the Chat Noir to the laughing violence of anarchist terrorism, The Life of the City is a timely analysis of the birth of a carnivalesque politics that remains highly influential in contemporary urban movements. Dr Julian Brigstocke is Lecturer in Human Geography at the School of Geography, Earth and Environmental Sciences, Plymouth University, UK.